The official website has also opened which means that the character synopsis is finally available for fans anxiously waiting for this drama. And it sounds so delicious. 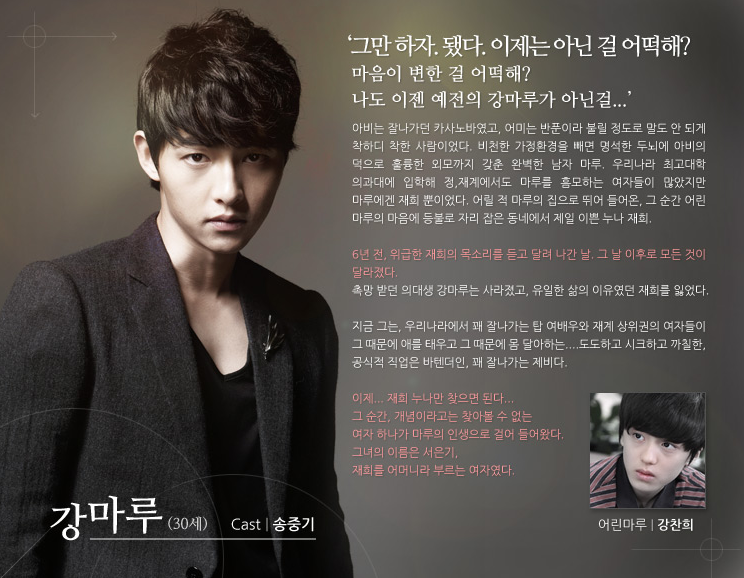 Kang Maru (Song Joong-ki)- 30 years-old. His father was a “casanova” while his mother was too sweet and innocent for her own good. Other than his family background, Maru has everything going for him- smarts and looks. As a medical student in South Korea’s top university, Maru was popular with woman from all areas, including those in the financial and political arena. But ever since Jae-hee ran through his door when he was a child, she has been the one and only light in his heart. But six years ago, everything changed after he received a panicked phone call from Jae-hee. The Kang Maru with a bright future disappeared and he also lost Jae-hee, his reason for living. Now Maru is a gigolo who has women desperate and pining for him. He’s been searching for Jae-hee but when he finally finds her, another woman enters his life- Seo Eun-gi. She calls Jae-hee her mother. Seo Eun-gi (Moon Chae-won)- 29 years-old. She’s been brought up by her father, the president of Tae-san Group, to be his heir. He’s taught her to always hide her true feelings and never trust anyone, even her own family. One day, she meet Kang Maru, a person her brain cannot comprehend. First she was scared of him. Then she was curious. Then she couldn’t stop thinking about him. Then she always wanted to see him. Then she wanted to possess him. Han Jae-hee (Park Shi-yeon)- 35 years-old. Her mother was a prostitute so Jae-hee does not know who her father is. The person she called “father” tried to sell her to a pimp to pay back his gambling debt. Kang Maru was the one who helped her survive that kind of environment. To Jae-hee, Maru was the house with the light always on. He was always there for her, smiling and waiting with his arms wide open. But once President Seo showed her a world so different from her own, her desire to change her life grew. So she did something terrible to Maru and turned her back on him. Here is the character relationship chart. The red lines represent love and you can see who the arrow is pointing to. Blue lines represent family and green line is friendship. We can see that Park Jun-ha, a Tae-san Group lawyer, loves Eun-gi while she loves Maru. Maru and Jae-hee love each other while Ahn Min-young, another Tae-san lawyer loves Jae-hee. Jae-hee also has a son with her husband who is also Eun-gi’s father. Maru has a half-sister named Choco who is love with his best friend, Park Jae-gil. Hee! Lots of love going around. Too bad most of it is one-sided or forbidden. Maru: Wasn’t it enough that you stepped on me so ruthlessly? Maru: How can I kill you before reaping the benefits of having saved you? 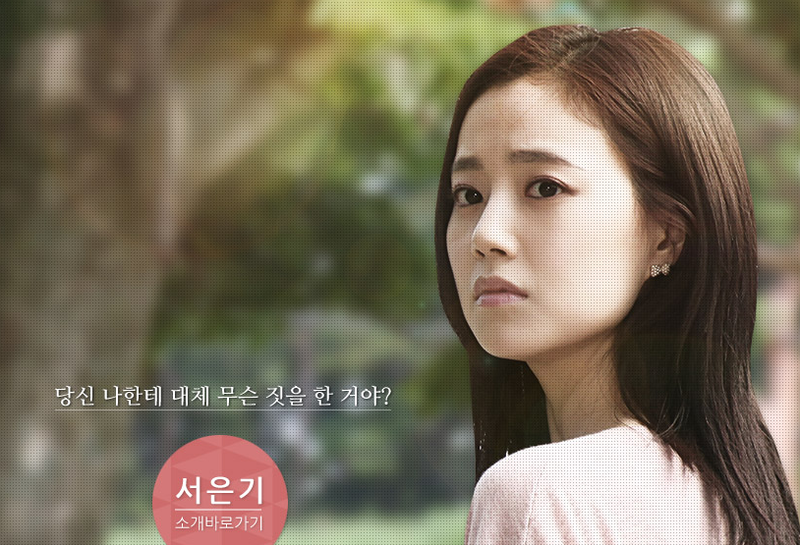 Jae-hee: I won’t forgive anyone who stands in my way. Eun-gi: Now look here, Han Jae-hee! Maru: You didn’t have to go this far because I was going to completely forget you! Maru: Let’s stop this. I’m not the old Maru. 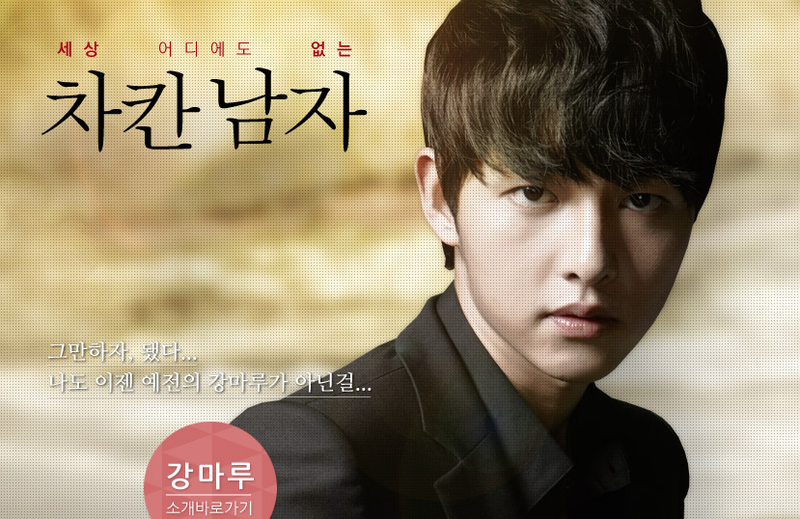 Judging just by the trailer, I say that Song Joong-ki is bringing his own brand of vulnerable anger to this drama. Lee Kyung-hee’s dramas tend to have very wounded heroes, which many actors have portrayed differently, bringing dimension and reality to the characters. I think Song Joong-ki is going to be perfect for this role since he is is very good at expressing raw emotions, while still maintaining composure. I’m so happy that this drama is going to be a straight melo. I’m a fan of comedy but since all dramas these days seem to have some element of comedy in them, I’ve been getting antsy for some straightforward intensity. Anyone else feel the same way? 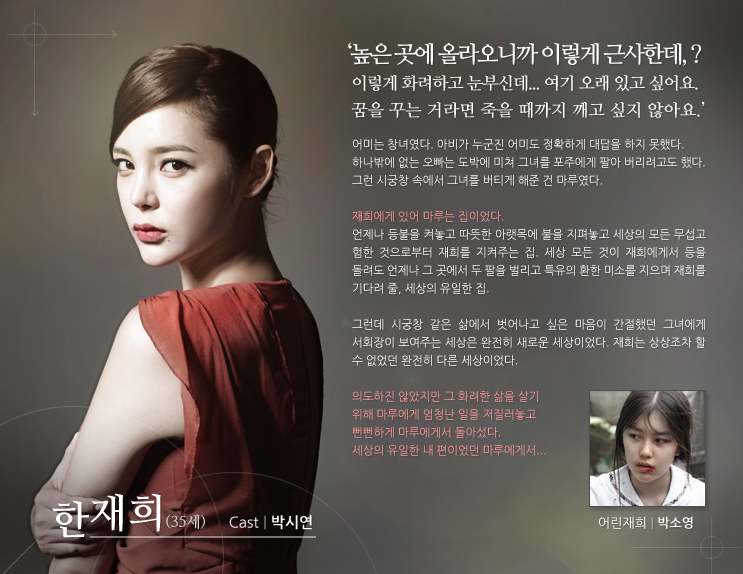 Jae-hee: Kill my lover’s daughter, Seo Eun-gi. It’s not Jae-hee but Eun Gi saying this like ‘I know what you did last summer’ kind of way. 🙂 Overall I really can’t wait for this drama. 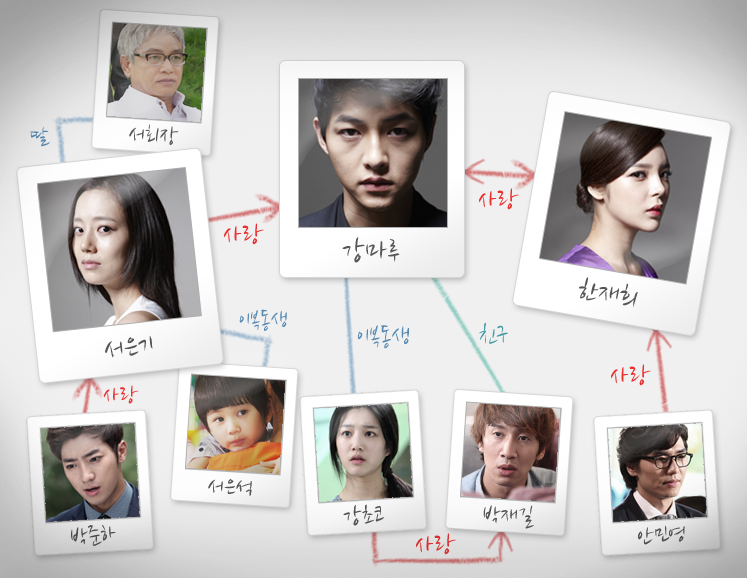 :3 BTW the character chart usually show the relationships how they are early in the drama, so it doesn’t mean that Eun i and Maru will not fall in love. I thought it sounded like Eun-gi’s voice but I was unfortunately distracted while writing this post so thank you for the clarification! If I can survive 28 episodes of screaming and full of torture gaksital with so little romance and I’m not even Joowon’s fan (great actor, cute guy, just not a fan), I know I can survive any makjangest plot with a prostitute mom and ruthless dad. Drama you had me at Song Jongki. I want to possess him too. The one thing I can rely on with Lee Kyung Hee is that she is going to have her actors doing a lot of glaring, staring, and longing instead of too much screaming. I am also very excited for a straight romantic melodrama. There aren’t enough!